I went into Pet Sematary, the 2019 remake of the classic movie based on a Stephen King novel, ready to be scared. Unfortunately, I came out to judgy. 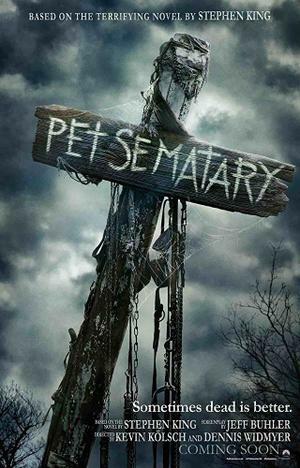 Don’t get me wrong, Pet Sematary was very scary and intense of a film. What I was judging was the people who were in the theater with me. There were at least two families in this theater with kids that were under 10 (if not younger). All I have heard is how scary this film was, so why are these “parents” bringing their young and impressionable children to see it? Selfishness is all I can think of because the parents wanted to see the movie and so they brought their kids. There is no little kid who sees the ads for Pet Sematary and think that this would be a great time at the cinema. And I am not even talking about teenagers, some of which would not be bothered by this (though it was very tense), but these little kids will clearly be having nightmare about this film because it was filled with gruesome images and violent scenes surrounding death and darkness. As an adult, I found the movie to be engaging and it certainly kept me on the edge of my seat, and I will recommend the movie to any ADULT who wants to see it. Maybe even some teenagers, depending on their outlook. But parents, for goodness sake, leave your little children at home. Jeté Laurence plays Ellie, the daughter of a couple (Jason Clarke and Amy Seimetz) who are looking to get away from the fast-paced world of Boston and have moved into the country, to a house on the outskirts of a forest. Before too long, they notice weird things happening and discover a pet cemetery on their property. Ellie meets neighbor Jud (John Lithgow) who has lived in this area his entire life and knows some of the magical characteristics of the land. And when the beloved family cat gets killed, Jud leads Jason Clarke to a powerful place to bury the cat. This is the biggest issue I have with the film was the reason Jud had Jason Clarke bury the cat there since he seemed to know that when the animals come back, they are not the same. The same thing happened to his dog when he was younger. The excuses he makes really do not play well and this is the biggest weakness of the story. If you can get past that, the story is one of loss and pain and what grief can do to you, what steps it might make you take. And, of course, if you mess with those forces that you cannot understand, things rarely go well. That cat was very creepy throughout the entire movie. So was Jeté Laurence, who has a remarkable performance as Ellie. She is a big reason why this film works and why you believe the odd twists that happen in the third act. While not as successful of a remake as It, Pet Sematary was creepy and moody, with some disturbing imagery that makes it worthwhile if you are a horror fan. And very unsettling if you are under 10 (shame on you, parents). This entry was posted in 2019 Movie Reviews. Bookmark the permalink.